COMMUNITY NEWS & REVIEWS: EWHURST PARISH COUNCIL - “GET WELL SOON” - Richard Farhall - Our well known Ewhurst Parish Clerk,- much admired for his vast knowledge on most subjects, his dedicated role -often over and above his Parish Clerk’s duties and always ‘on-hand’ for advice, guidance and opinion - is taking a bit of a back seat at the moment ! Following a recent operation on his hand, his work load has lightened ‘slightly’ due to an enforced ‘rest period’. Due to the nature of the operation, this has been imposed upon him as he often appears to have his P.C. permanently glued to him and never appears to have need of sleep ! All your Ewhurst Parish Councillors and fellow working colleagues of both Ewhurst Parish, Rye Town Council, as well as R.D.C. and E.S.C.C. wish you a full and speedy recovery and trust that all will be well at the end. Get Well Soon Richard - and kindest regards from all the residents of Ewhurst Parish Community. -- On Friday last (30/11) a large and very welcome gathering presented themselves on the front lawned area of our village Hall in Staplecross to witness the ‘switching on’ of the Community Christmas Tree lights. Many of these were parents of the pupils from our local village school who were having great fun at their PTFA Fun Fair inside the hall. Having checked all was well two days previous, and in the process of re-affirming all was in full working order to hand over to the ‘chosen ones’ - it was discovered that the wires linking the lights to the power source had been cut !. This was NO ACCIDENT- the wires had NOT been chewed by a mouse or rat or any other creature - just simply deliberately cut by a mindless and uncaring human!, with no consideration to the sad disappointment of all who came to enjoy this little fun ‘ceremony’ as a result of this thoughtless act. Happily the fault was quickly rectified and following the short delay, the time came for the very simple and happy “Switching On” ceremony to take place. The children and staff, together with families, friends and neighbours, as well as members of Ewhurst Parish Council, all came out to see the youngest member of the school - Master Thomas Page, (aged 4) and ably assisted by Mrs Doreen Beeden who although by no means the ‘eldest’ resident - is certainly one of the longest and well respected residents of our community -jointly switch on the lights and bring our first Community Christmas Tree to life. Judging by the comments received , disgust and distaste quickly turned to delight as the little twinkling tree lights worked their festive magic on the audience. Short and sweet this may have been, but plans are already afoot to make more of this little ‘do’ for next year, to hopefully include Carols, Mulled Wine & Hot Mince Pies, making the most of our community spirit - the true spirit of Christmas. ROTHER RAMBLERS: Two delightful walk are organised for this week and should appeal to many. 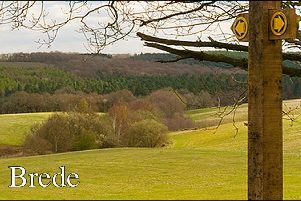 Walk No: 1 is planned for Sunday December 9th and is a 7.5 mile circular meander around Firle. The meeting point is Firle Village car park. OS.EXP123. TQ469074. (satnav BN8 6NS) at the normal time of 10.00am. The walk notes state “This is a Downland walk from Beddingham to beyond Firle Beacon, returning via Charleston and Firle Park. As usual a picnic lunch is suggested. Adrian is to be your ‘walk leader’ for this trip and you may contact him on 01273~51554336 or mobile:07729~861854 for more information. Walk No: 2 is arranged for Thursday December 13th and is of a slightly shorter foot mileage, being just a mere 6 mile circular stroll of Ticehurst and Bewl Water. The meeting point is to be at the Pickforde Lane car park in Ticehurst. OS.EXP136. TQ689303. (satnav TN5 7BQ) again at 10.00am. The walk notes here state “This will be a morning walk with the option of lunch at the “Greedy Goat Cafe” in Church Street, Ticehurst following the walk. Rita and Lionel are to be your ‘walk l;eaders’ for this excursion and you may contact them on:01424~752452 for more details. STAPLECROSS LUNCHEON CLUB: A wonderful Christmas Menu awaits all the members and their guests - (as well as any members of the community who feel they would like to come along and join our small but very friendly dining group ) Christmas wouldn’t be Christmas without eating turkey with all the trimmings, followed by Christmas Pudding and all that goes with it, and this meal will be no different. However, if you don’t like turkey, - or are a vegetarian, vegan or have other dietary concerns, then an alternative menu could be provided for you.- but please do contact our organisers ASAP in order for them to arrange this in time for you to join us. The ladies to contact are Sally on 01580~830000 or Pauline on 01580~830570. The meals cost £6:00 per person which is still amazing value and taken amongst congenial company is the best place to share a meal. The date set for this festive foodie gathering is slightly earlier - Wednesday December 12th. Everyone is welcome to come along and join us, not only at this special time of year, but perhaps in 2019 also. We promise to make you very welcome, as we are a very friendly group and look forward to sharing our table with you. So please don’t miss it !. STAPLECROSS M.C. PRIMARY SCHOOL: NATIVITY PLAYS - These charming and delightful renditions of an age old tale are always performed with such sweetness, joy and ‘gusto’ that each and every performance is a pleasure to witness. Every child in the school takes part and has a part to play, which shows us all a true reminder of what Christmas is all about. The two performances this year will take place on Thursday December 13th at 2.00pm followed by a repeat on Friday December 14th at 6.00pm. Both ‘productions’ will be staged in the Staplecross Village Hall. Please come & join us. CAROLS BY CANDLELIGHT: Songs that depict the coming of Jesus and the true story of Christmas are being sung throughout our area at present and all are beautiful to listen to. Here in Ewhurst Parish we are especially blessed as on Saturday December 15th.there will be a particular treat for us all as a special ‘Carols by Candlelight’ service has been arranged and this will be performed by that wonderful choral group the ‘Tongswood Choir. This will take place at 6.00pm in St. James the Great church, Ewhurst Green. The atmospheric lighting of these candles omitting their gentle glow throughout this warm, welcoming and peaceful church only adds to the ambience and joy of this special occasion. If you love to hear carols, sung in a beautiful country village church then treat yourself and come along. All will be very welcome. THE HUB: ‘INTERACTIVE NATIVITY’ All residents of the community and beyond are invited to come along to The Hub, Quarry Farm, Bodiam, and join in the fun for an immersive Nativity like no other. This amazing event has grown from strength to strength over the past few years and this year will take place on Monday December 17th between 5 and 7.00pm. This is far from your typical nativity but come along and join in this fun festive interactive journey. Your quest is to follow the star around the farm to find a few wise men en-route to unveiling a traditional nativity scene. At the end of your journey, there will be carol singing in the barn, again spreading the Christmas joy and to round off this extraordinary evening, come and try the mince pies, mulled cider and a wintery supper in their café. With no need to buy a ticket, everyone’s invited, which means that you can bring along all your family, friends and neighbours. The invite says “ as long as you come with your Christmas spirit, we won’t be charging you to join in with us on this special journey “. Visit The Hub on Facebook to find out more and register your interest in this event, to enable them to cater for everyone. This promises to be a fun filled family treat, - so make sure you don’t miss it !. EWHURST GREEN -- CAROLS ON THE GREEN - A warm and welcoming invitation is extended to everyone to come along and join in the ‘singing of carols around the tree’. This is to be held in Ewhurst Green, on Friday December 21st beginning at 6.00pm. and is a really lovely way to spend a hour or two amongst family and friends, singing age old carols in a fabulous atmosphere. The hot mulled wine and mince pies also adds to the conviviality and you will be forgiven for singing out of tune here, as folk will just be singing for pure pleasure, so why not come along and join in the fun and festive singing. A song sheet will be provided to hopefully, help you get the words right and a collection in aid of Ewhurst P.C.C. will be made during the singing. A simple and pleasant way to enjoy an hour or so amongst congenial company, so do come along and join us. We all look forward to seeing you on the night. CHURCH SERVICES: Church Services for the Parish of Ewhurst will commence at St James the Great church, Ewhurst Green on Sunday December 9th. Advent 2. at 9.30 am. This service will include Holy Communion (BCP) An Advent Praise service at St. Mark’s church, Northiam Road, Staplecross will follow directly after at 11.15am. This service will also offer Holy Communion. There will be NO SERVICE today at St. Giles, Bodiam.. If there is any church matter on which you feel you may need further assistance, especially Baptisms, Weddings and sadly, Funerals, then do please get in touch with our Priest in Charge, Canon Christopher Irvine on 01580~830925. He is always there to care and support you and unselfishly will guide you towards the solution that is right for you.